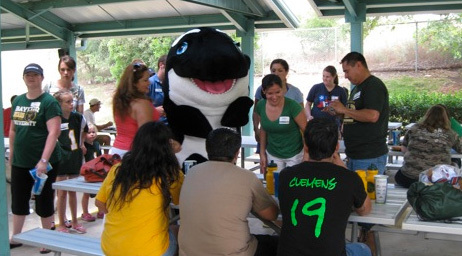 Based on the turnout for Diadeloso Texas, held at SeaWorld in San Antonio in June, many alumni miss celebrating the Baylor holiday. More than 750 Bears of all ages turned out for the fourth-annual event. Alumni, current students, parents, faculty and staff enjoyed a day of fun at the park, surrounding other SeaWorld visitors in green and gold for the day. The sheer numbers of Baylor fans wandering the park led many other people to ask what was going on, opening the door for Baylor fans to share their pride in their alma mater. Hosted by the Baylor Alumni Network, Diadeloso Texas is one of the largest annual gatherings for the Baylor family -- but certainly not the only one. June 20 was Baylor Night at Rangers Ballpark; Lady Bear favorite Melissa Jones threw out the first pitch. July 16 was Baylor Night at the Astros, with discounted tickets and a postgame concert from the BU alums in the David Crowder Band. Then of course there were the summer send-off parties for students headed to Baylor from all over the country -- 61 events across 28 states, from Seattle, Wash., to Washington, D.C., and from Chicago to Kerrville (with Houston, Dallas, Austin and the other usual suspects included as well). Baylor Alumni Network groups host regular gatherings all over the country and around the world. For additional information, visit www.baylor.edu/network.